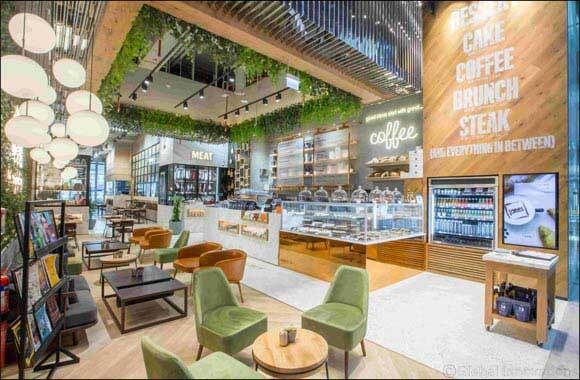 Dubai, UAE, April 02, 2019: The long wait for fresh, natural and wholesome gourmet food is finally over with Jones the Grocer officially opening its doors at Dubai Mall on the 26th March 2019. Diners can relish their favourite food at this first restaurant to be opened in partnership with Al-Futtaim. True to its ethos of gourmet food for everyday living, this exquisitely designed store features a theatre kitchen, bakery, patisserie, artisan cheese and charcuterie rooms and a meat ager that dry ages choice cuts of meat. Diners can savour a modern food emporium that draws them in to eat gorgeous handmade food, source gourmet food retail or linger over a creamy flat white. The Dubai Mall location also features a 100 seats balcony with stunning views of the Dubai Fountain, a unique children’s play area and a Jones coffee caravan serving a selection of smoothies, juices and lattes. The newly launched tasty grill menu at Jones the Grocer Dubai Mall is the ultimate feast, and diners can tuck into mouth-watering options, from Moroccan spiced lamb shoulder on rosemary flatbread to Jones signature dry-aged Australian Black Angus tomahawk, Jones Wagyu burger with crumbed brie and chargrilled harissa chicken. Sharing a meal with friends? Try the new sharing menu, including signature items such as the artisan cheese platter, cured & curd platter and the Jones sharing platter featuring tasty treats from the charcuterie and cheese room. The meat ager, a first for a Jones the Grocer store in the Middle East, will carry prime butcher’s cuts such as the succulent Jack’s Creek Australian Black Angus beef. The meat is prepared with absolute care and precision, then dry aged above Himalayan pink salt imbuing it with a tender melt-in-mouth feel that is bursting with flavour and is sure to leave diners wanting more. That’s not all; Jones the Grocer has a special treat for cheese lovers! Diners can explore a walk-in cheese room filled with over 80 varieties of cheeses sourced directly from artisan farmers and cheese-makers, ranging from Tete de Moine from the Swiss Alps to aged Comte from France, Truffle Gouda from Holland and Alp Blossom from the foothills of the Austrian Alps. In addition to this new grill menu, diners will be able to enjoy the famous Jones the Grocer breakfast as well shop from a carefully selected range of specialty chocolate, exclusively roasted coffee beans, teas, cheese accompaniments, Australian yellow box honey and other gourmet groceries and impulse snacks to feed a hungry shopper. Jones the Grocer, is located on the ground floor at Dubai Mall opposite the main entrance to Level Shoe District.